ORLANDO, Fla., June 8, 2018 /PRNewswire/ -- As part of its mission to protect animals and habitats worldwide, and just in time for World Oceans Day, SeaWorld Entertainment, Inc. (NYSE: SEAS) today announced that all 12 of its theme parks have removed all single-use plastic drinking straws and single-use plastic shopping bags. "This milestone environmental achievement is a testament to our mission to protect the environment, the ocean and the animals we share our planet with, which are currently threatened by unprecedented amounts of plastic pollution," said John Reilly, interim chief executive officer for SeaWorld Entertainment, Inc. "We see the harmful effects of plastic pollution in the animals we rescue and rehabilitate, and therefore, recognize the importance of doing our part to curb plastic pollution." Recent news and studies have shown alarming consequences of the growing threat of plastics to our oceans and wildlife. The Ocean Conservancy, a nonprofit environmental advocacy group, estimates that eight million metric tons of plastics enter the ocean each year, on top of the estimated 150 million metric tons that currently circulate the planet. This prevalence of plastics in the ocean has been making its way into the diets of marine animals that mistake it for food and become sick or even die. "We've seen first-hand the horrific damage that plastic pollution causes to animals," said Jon Peterson, manager of rescue operations at SeaWorld Orlando. "Some studies have indicated that more than half of sea turtles out in the wild ingest some form of plastic. In fact, just this week, we performed surgery on a rescued sea turtle who became ill from ingesting plastic and other ocean debris." 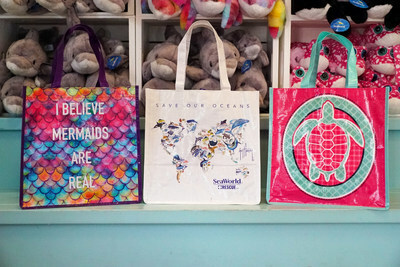 With this commitment to remove single-use plastic straws and shopping bags from its parks – including SeaWorld and Aquatica parks in Orlando, San Antonio and San Diego; Sesame Place; Adventure Island; Water Country USA; Discovery Cove Orlando; Busch Gardens Williamsburg and Busch Gardens Tampa Bay - SeaWorld joins the ranks of other organizations and government entities working to reduce the use of single-use plastics, such as Alaska Airlines, Hilton, and Hurtigruten. "We applaud SeaWorld's commitment to important conservation efforts that support our environment, oceans and marine life," said Chris Fischer, founding chairman and expedition leader, OCEARCH. "We all need to do our part to educate the public about the harmful consequences of plastic pollution, which we see all too often. We're proud to partner with a like-minded company like SeaWorld and look forward to continuing our work together to better understand and protect the habitats of marine animals." Despite these strides in curbing plastic pollution, more work remains to reduce the company's environmental footprint. That's why SeaWorld is continuing to invest in more renewable energy, such as the recently launched solar array at Aquatica San Diego, which is expected to generate 80 to 90 percent of its power from solar energy. SeaWorld also lowered its greenhouse gas emissions by nine percent from 2014 to 2017 and improved recycling of waste materials by more than 50 percent over the same period. Additionally, we continue our efforts to sustainably-source the food that is served at the parks, including cage-free eggs and certified organic coffee, and have implemented a range of water conservation efforts that are in place, including harvesting rainwater, reusing water for cooling buildings, and adapting landscaping to require less water. "We're proud of the incredible progress our parks have made in waste, water and energy reduction," said Bill Street, SeaWorld's corporate curator of conservation and education. "It's efforts like these, multiplied by key partnerships with conservation-minded organizations, that will continue to make a difference in how we impact our planet and benefit the amazing animals that call it home." Jon Peterson, Manager of Rescue Operations at SeaWorld Orlando, discusses the often life-threatening impact of plastic pollution on marine wildlife.